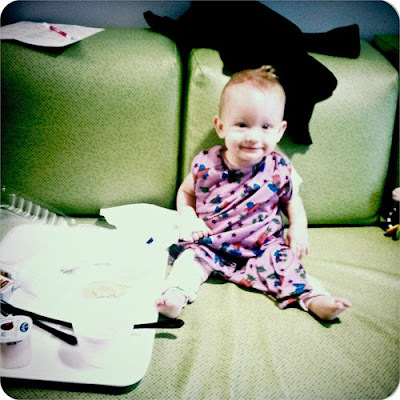 Ruth's Story: ETV Surgery - done! We arrived at the hospital for surgery. We were grouped with the day surgery kids as well, and I would say 90% were there for ear tubes. We had been told that Ruth would need an IV before surgery to get antibiotics, but since we had decided to go with the ETV surgery instead of the VP Shunt, she ended up not needing them (they placed the IV after anesthesia in the OR). We met with anesthesia and a couple nurses, and then her neurosurgeon came to talk with us. He asked us what surgery were had decided on, we told him ETV, and he agreed that was what he would have picked. He asked us "for a favor", he asked if he could pray with us. He placed his hand on Ruth and prayed while we all bowed our heads. How awesome is that? God has a big place in a hospital, I'm glad He is with our surgeon. We then moved out to a play room/waiting area to wait. Her surgery was scheduled for 8:45, but when 8:45 rolled around and we were still in the waiting area, it became apparent that time wasn't happening. Ruth was in good spirits considering she hadn't eaten anything since 3am. Finally around 9:30am, they moved Ruth back to the final waiting area. Only one parent could go with her here, so Matt and Ruth had to say their goodbyes. Since Ruth has some major separation anxiety going on, they gave her a nose spray that made her goofy, and we spent the next 15 minutes watching the other kids in the room. Most were there for ear tubes. One poor girl was crying, she was old enough to know what was about to happen to her. When her nurse finally came for her, Ruth refused to lay down on the stretcher, so the nurse and Ruth rolled away with Ruth sitting up and her nurse behind her half laying on the stretcher/holding onto Ruth (who was a little woosy from the medicine), and pushing the stretcher with her lower body. I was the only one that cried at that separation. I then headed to meet up with Matt in the surgical waiting area. We were amused watching how many times the ENT came in, that guy does a lot of surgeries! The nurse in the OR calls to the surgical waiting area to give any updates, and she called about 5 minutes after I got there. She wanted to know if we minded if some people observed the surgery, and I didn't. I guess since the ETV isn't done often in Spina Bifida there were many people curious to watch. Poor girl, she has always had quite the audience at her surgeries. I got my first update from the OR nurse. Ruth was under and prepped, and the neurosurgeon was beginning his part. She told us that he would be out to speak with us when he finished. We knew the actual surgical part only took about 15-30 minutes, so we began to very nervously watch the clock. We knew if it took too long, he was pulling out and doing the VP Shunt instead, or some other complication occurred. 15 minutes past. 20 minutes past. 30 minutes past. Nothing. We were both praying silently, that wait was one of the longest in my life. Finally about 40 minutes later out walked our wonderful pediatric neurosurgeon. With a smile! He said the surgery went as well as we could hope for. He said her anatomy was typical of what he sees in spina bifida, but he could see well enough to perform the ETV. He said there was some bleeding in her brain (he warned us that this was a possibility), but not enough to be worrisome. He told us she already had the breathing tube out, and was awake and angry! Meaning he stayed with her until she woke up! That was what took him so long to come out to talk to us. We then waited until she was deemed stable, and met her in the hallway to walk to her hospital room on the post op surgical floor. She woke up when they transfered her to her bed, and was very upset. I picked her up and she calmed down, and after about 15 minutes, was awake enough I felt she could eat. She spent most of the day attached to me. I know she was hurting, not understanding what was going on. But she had a few moments when she was very awake and happy, enough she felt like playing. I took out my "big" camera and snapped a few photos of her during those moments. But for the most part, she was pretty pitiful. Her room setup. 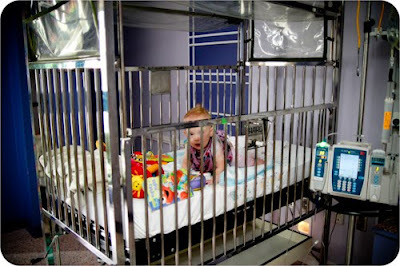 I kept worrying that she would hit her head on that "prison" crib! Matt also brought our oldest daughter up for a quick visit that evening. Ruth did sleep fairly well, so I managed to grab a few hours of sleep. She made sure I was right next to her at all times, so I had to lay her down in her crib facing away from us so I could lay down too. They brought her some solid foods for the first time, and she was HUNGRY! I have never in my life seen her eat that well. In fact, she has been eating 3 solid meals since then. I wonder if the hydrocephalus was affecting her more that we realized, because I was lucky to get one solid meal down her before the surgery. We had a pretty quiet morning. We knew the surgeon had clinic that morning and didn't expect to see him until the afternoon. Her blood pressure had been high since about the middle of the night, and we weren't sure why. We thought it might be from pain, although really she was acting ok, but we tried some higher power medicine to see if that helped. It didn't really, so we were a little concerned, but the nurses weren't freaking out about it so we tried not to. When her neurosurgeon came by to visit, he walked in and asked "Are you ready to go home? ", and we didn't argue with him! He talked with us about what to watch out for, what to call him about, and what to head straight to the ER about. She has her follow up in about 1 month, so no physical therapy until after that. 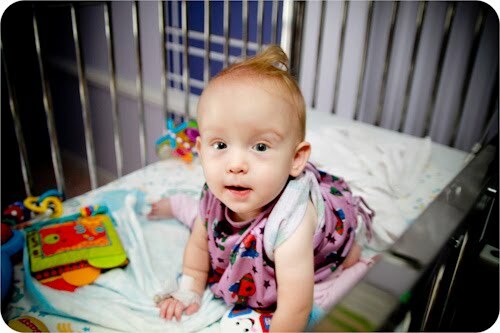 We will be watching for swelling and other symptoms of hydrocephalus that would indicate that the ETV has failed. He also wants to do a repeat MRI in about 2-3 months to see if it is working. The odds of it working long term are about 50/50, so there is still a good chance she will end up back at the hospital to get a VP Shunt placed. 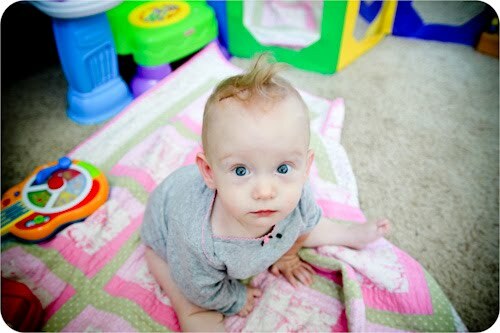 But we are praying (hard) that this will work for her and she would NEVER need another surgery for hydrocephalus! With all the excitement about going home, we forgot to ask him about the high blood pressure. The nurse found his PA and she said to take her blood pressure again and we will see. It was STILL high. 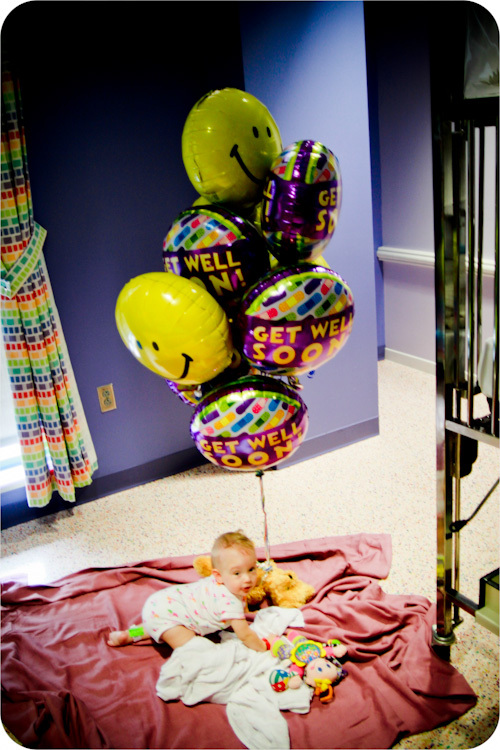 But they felt like it wasn't enough of a reason to keep her in the hospital, so home we went! We do think the ETV is working now. The swelling on her back where her spina bifida lesion was has gone down significantly. The veins on her forehead and around her eyes aren't nearly as prominent as they were. And she is EATING a ton! The scar isn't too bad. Once her hair gets thicker is won't even be noticeable. And they didn't have to shave or cut her hair any, so from a distance one wouldn't even notice. We have been home for about a day now, and she is slowly getting back to her old self. It is amazing how quickly kids can bounce back from such a major surgery! I also want to mention how much we appreciate the many many many prayers, messages, thoughts, etc from family and friends! We soo appreciate it! 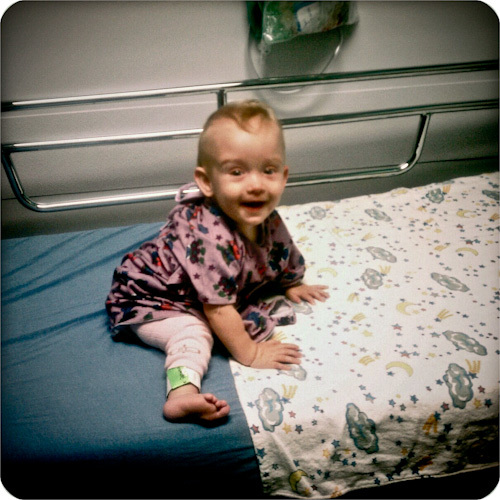 Please keep praying that the ETV will continue to work, and she will need no more surgery! I also want to thank my Mom, who has driven the long drive twice in the past two weeks to watch our other kids. We knew they were very well taken care of! I am so glad everything went so well! Ruth is (of course) absolutely adorable! And she seemed to have bounced back so fast! It's amazing the changes you see after the surgery and think - oh hydro was causing THAT! I'm so happy that the surgery went well. I know exactly the dr you are talking about, he did Caleb's revision last fall and he also prayed with us before hand. I'm so happy things went well! We've been thinking of you guys. Hugs to Ruth! Woooo hooo Ruth! Even stronger and ready to face the world! I pray that the ETV keeps on doing it's job!! This is similar to our story with our son. May God continue to bless your family.